SEOUL, 4 June 2013 – The Embassy reported to the Department that Post’s Tourism office received two prizes at the recently concluded 26th Korea World Travel Fair (KOTFA). The Philippine sales mission, led by Tourism Attaché Maricon Ebron and composed of PH airline, hotel and resorts reps as well as tour operators, garnered the Best Booth Operations Award and the Best Folkloric Performance for the Davao City-based Kalumon Performing Ensemble at the KOTFA held at COEX Korea Exhibition Center from 30 May until 02 June 2013. The group highlighted Davao/Mindanao indigenous music, dances and songs at the travel fair. The Seoul fair is considered the biggest of five held by KOTFA in Korea for the travel industry. Some 85,000 Korean and international airline companies, hotel and travel agencies attend the event. 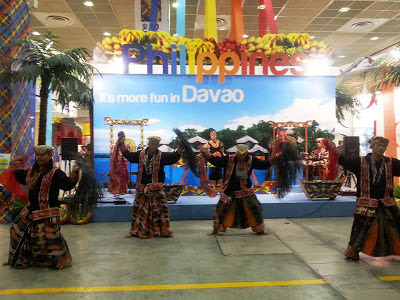 Koreans make up the third biggest foreign arrivals in the Davao Region, with 7,983 tourists. DOT Korea is positioning Davao for this leading source of inbound tourists, which reached a record 1 million arrivals for the entire Philippines in 2012.